There’s nothing like an upcoming deadline to help me be productive. Jane Case Vickers and I have a show coming up in April at the Krempp Gallery at the Jasper Arts Center in Jasper, Indiana. This weekend I’m working to make art out of my sister’s bead collection. I had one, too. When we were in elementary school or junior high, we discovered a store in Toledo, Ohio that sold nothing but beads. 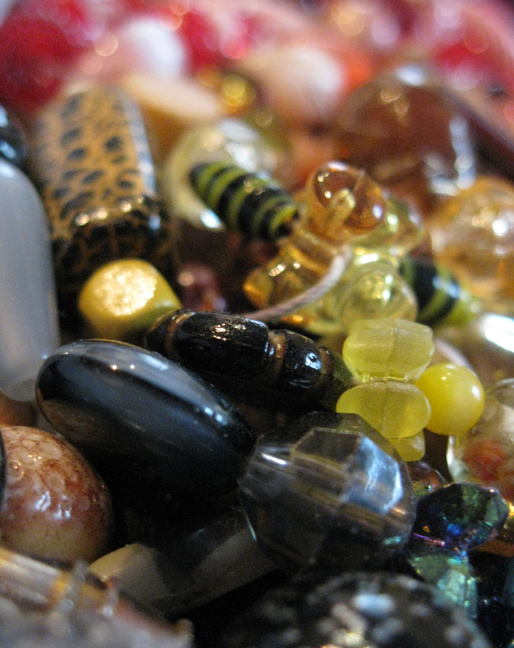 Our bead collections are the result of hours spent searching through all the glittering cups of beads. We would sort them, string them, resort them, and restring them. I’m working to find a way to highlight the beauty and value that my sister and I gave to these things of little real value, and through that, broader themes of collecting, saving, creating value, and creating beauty.